I checked out this book based on Jessica’s suggestion as it was just featured as a 2012 Sydney Taylor Honor Book for Younger Readers. 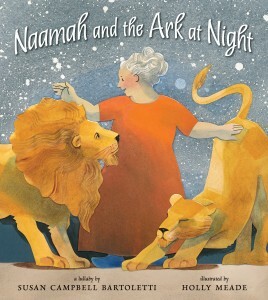 As is apparent from the title, Naamah and the Ark at Night, by Susan Campbell Bartoletti and illustrated by Caldecott Honoree Holly Meade, is a Noah’s Ark story but not exclusively so. It is also a bedtime story where the lady of the house (or in this case, ark) ensures that all its occupants are resting contentedly before retiring herself. How nice! I love that it combines two of my favorite things: animal love and God. I love the illustration on the cover, how the lioness is stretching as Naamah runs her hand down her back.